Purchase advance tickets for this event using Paypal or your major credit card. Be sure to select the ticket quantity as well as the appropriate ticket type (Member or Non-Member). Note: If you require multiple ticket types (ie: 1 member + 1 non-member ticket), please add one type to the cart, return to the page, and add the second type separately. If Django Reinhardt, the cast of Stomp and the Beatles all had a party at Tim Burton’s house, New England’s Caravan of Thieves would be the band they hired. Driving gypsy jazz rhythms, acoustic guitars, upright bass and violin lay the foundation for mesmerizing vocal harmonies and fantastic stories. It’s theatrical, humorous, musical and intense, while welcoming spectators to join the band throughout the performance in momentary fits of claps, snaps and sing-alongs. 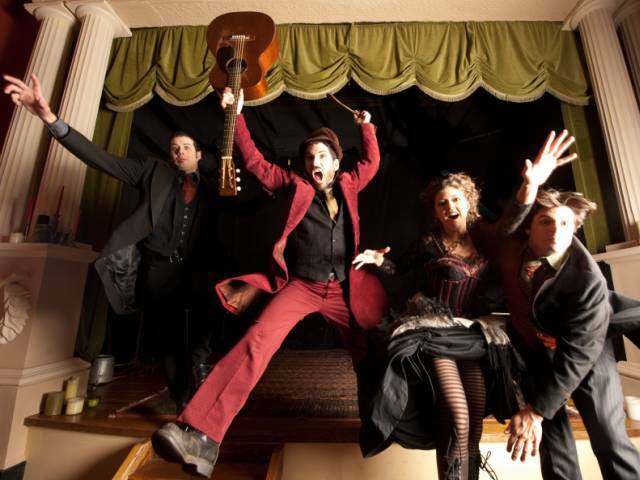 This exciting group are on tour in support of their new single, “Dead Wrong”, and will treat us to a show that’s on the high road to musical perfection, – that channels pop bliss through their trademark lock-tight, turn-of-the-century, bang-out-a-beat-on-anything-that-can-take-it approach. 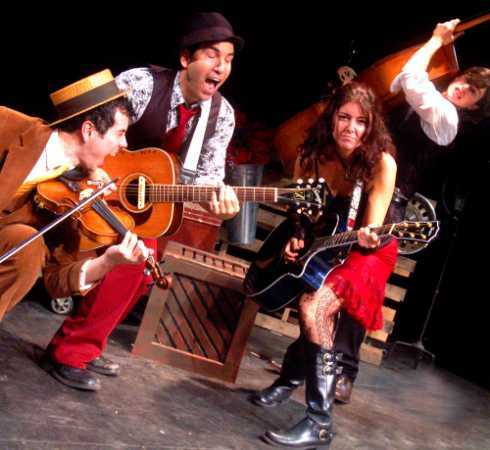 Like many families, Caravan of Thieves was started with a married couple, Fuzz and Carrie Sangiovanni, (guitar, vocals, and various percussive “instruments”) writing and performing as a duo. By the spring of 2008, Fuzz and Carrie had extended their “family” to include fiery violinist Ben Dean and double bass madman, Brian Anderson, completing their colorful vision. Within that first year, Caravan of Thieves began to win immediate praise for their unique blend of gypsy swing and popular music. Since then the band has taken their dynamic live experience on the road, sharing stages with world-renowned artists such as Emmylou Harris, Dan Hicks, Nanci Griffith, The Decemberists, Tom Tom Club, Iron and Wine, and many others. Their infectious live show has also caught the attention of festival promoters across the nation and the band has enjoyed appearances at Summer Camp (Chillicothe, IL), Mountain Jam (Hunter, NY), Herndon Festival (Herndon, VA), Musikfest (Bethlehem, PA), Four Corners Folk Fest (Pagosa Springs, CO), and Catskill Chill (Hancock, NY). First Saturday Concerts are held at the Congregational Church of Huntington, 30 Washington Drive, Centerport (at the Eastern border of Huntington, off Route 25A). Click here to launch Google Maps and get directions to the venue.